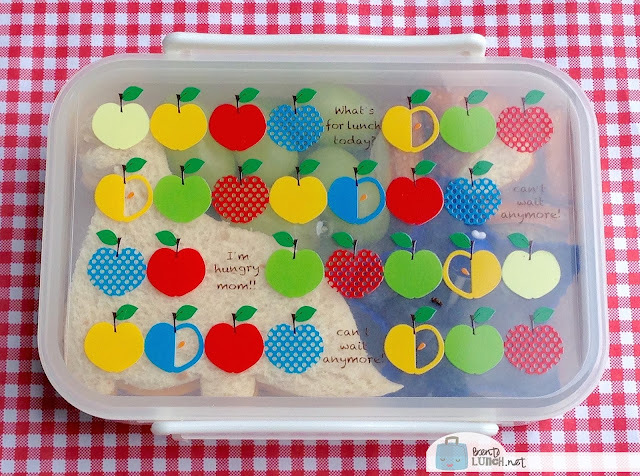 BentoLunch.net - What's for lunch at our house: New Box, New Bento! Occasionally, I buy myself things I just think are cute. This box is one of them. The apples on the lid and the little sayings are kind of perfect. "I"m hungry, mom! Can't wait anymore! What's for lunch today?" Sounds vaguely familiar, at least at my house, where I feed two ravenous beasts hungry children. The dog usually gets in on the game too--he can tell time and count the number of scoops I put in his bowl. Despite it's diminutive appearance, this box actually holds a fair amount of food! Inside, we have a turkey and cheese dinosaur sandwich. It's actually both halves of the dino sandwich, stacked on top of each other. The depth is perfect for it. 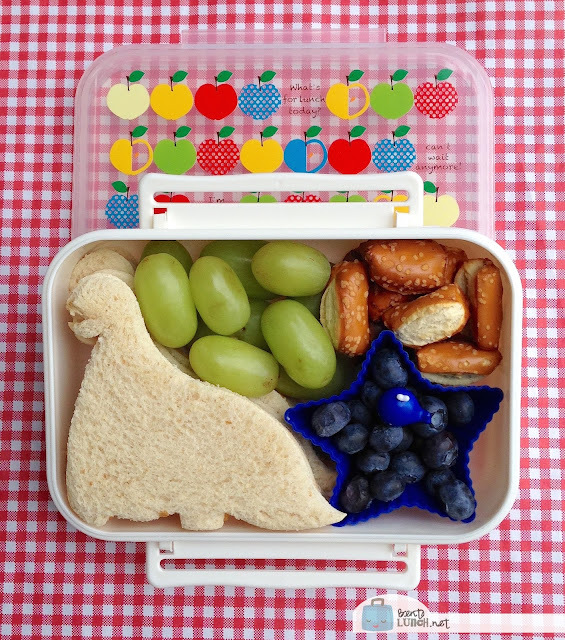 To the right of the dino, I added a star cup full of blueberries. Since the sandwich and blueberries are separate, I stabilized the rest of the box with grapes and pretzel nuggets. Grapes are my current favorite lunch add-in since they aren't messy, they don't leave juice or affect the food next to them, and they are sturdy enough to actually stop other foods from moving. What more could you ask for?